Optimizing ? eet operations means streamlining procedures to meet impending regulatory pressures and challenging market conditions alike. 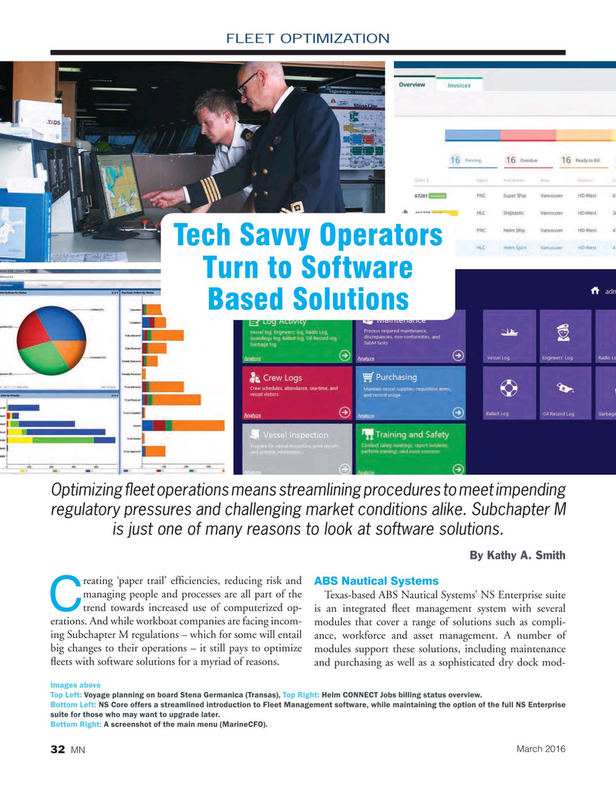 Subchapter M is just one of many reasons to look at software solutions. Top Left: Voyage planning on board Stena Germanica (Transas), Top Right: Helm CONNECT Jobs billing status overview. Bottom Left: NS Core offers a streamlined introduction to Fleet Management software, while maintaining the option of the full NS Enterprise suite for those who may want to upgrade later. Bottom Right: A screenshot of the main menu (MarineCFO).